I love a good scarf to drape around my neck. Something that keeps me warm and fuzzy and is cute to boot. It was inspired from this scarf I found at Ruche (ps LOVE that site). Since I don't knit, I immediately started brainstorming how I could make myself one. Then I found this long sweater cardigan worn when I was prego with Littlest Man. I did a little dance, literally. I realized right away this would be the perfect thing to make into a dreamy braided scarf. After picking up some coordinating yarn to make the delightful pom-poms for the ends, I went to work. Just in case you have a long sweater hanging about, I am going to give you that basics on how to make it. Cut 6 strips from your sweater. 4" wide and the longest you can possibly get. I got about 35 inches per strip. Make your self some floofy pom-poms. Here is a link when I made them for a party hat, to make big ol' poms, wrap the yarn around your palm instead of two fingers. Pair up your sweater strips. Giving you 3 pairs. With right sides facing sew one edge together, giving you a really long strip. Repeat for the other pairs. Next fold each strip in half, lengthwise with like sides facing. Sew up the edge. Turn out. This will give you three long sweater tubes. Starting at one end, pin three strips together wide and flattish (totally a word) and start braiding. Not too tight, you want it to be chunky. Sorry no specific picture for this. Don't ask me where it went, tis a mystery...oh that is right I didn't take a picture. Oops. 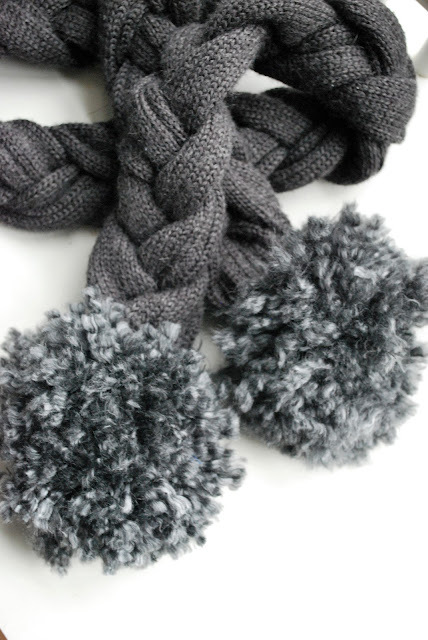 In order to fasten your poms to the bottom of each side of your scarf, there needs to be a couple strands of yarn that stick out. I simply threaded a larger needle with yarn and looped the yarn through the middle. I pinned the poms in place, folding the longer strings in between the flat ends of the bottoms of the braids. At first I tried machine sewing them in place...BIG mistake, at least for my sissy machine. Your Popeye of a machine may be able to do it. I ended up hand sewing them in place. In order for them to be REALLY secure, I hand sewed the entire bottom edge closed, back and forth several times. This seam is hard to see so don't worry about being perfect, just get the poms snuggly in there. "Why yes sir I really did." It my be one of my favorite crafts so far! I have to say it's beautiful! I think I am going to have to go to the thrift store and find a sweater that I can do that with. So cute and easy to. I will be able to put it to very good use right now. We haven't hit 20 degrees in about a month. This is fantastic! Really love the length - I might have to search thrift stores for old sweaters! Fabulous! I love the braided look and a good refashion. Thanks so much for sharing. Wow, that really looks great. I would have quessed it for a very expensive scarf. Impressive! I found you through the Handmade Linky party. That is really really cute! I'm bookmarking it on my list of gift ideas. Well Done!! I have seen this done with wool sweaters and then boiled to shrink and felt it, but you need much longer strips and real wool. I loved that scarf when I saw it on the Ruche site as well. This is a fantastic version of it! I love it! I saw that scarf and thought the same thing. I'm so linking this up to FB & Twitter. Thanks for linking up to my Pity Party! Thanks guys for all the love of the scarf. I have hearted wearing it. Thanks so much for stopping by Yellow Blackbird. I love this project. So creative and cute! Aww, that is so fun and pretty! I love the playful pom poms. Thanks for the how-to, I'll be linking. OH MY! I ADORE this! I have a sweater or two from prego days left...I think I know what I am doing! Super adorable. I don't have a sweater to cut up and don't knit but I do crochet. I think that I will crochet myself some strands to braid. Thanks for the inspiration. This is so great, Larissa! 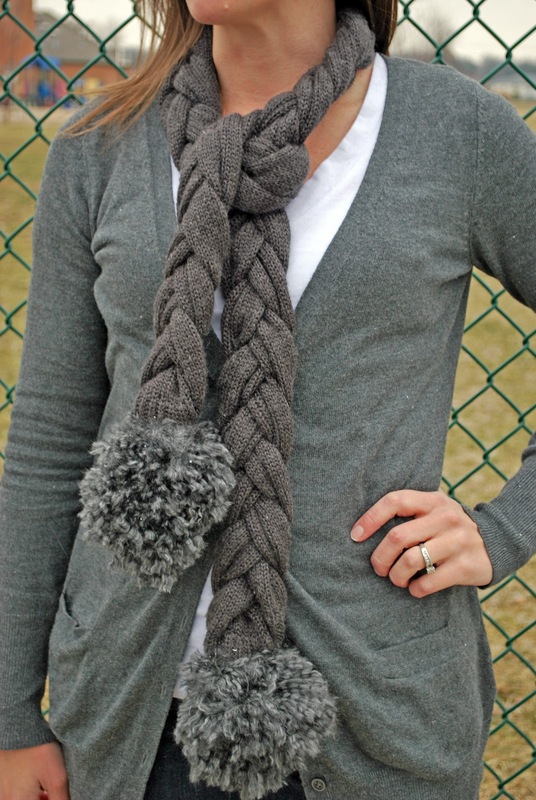 Super cute scarf! I think I'm going to have to make one soon. Thanks for the inspiration! Im going to have to hunt down a long sweater and make one of those! Brilliant tutorial! Hi! I love also scarfs and this is just the most wonderful! Great idea and you have made it lovely! LOVE it! Thanks for auditioning for American Crafter! This is so stinkin cute! 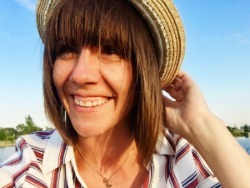 I love Ruche as well:) I came across your blog from 30 days and I think I have looked at every post!! I love it, looking forward to following! That is beautiful! wonder if it would work in fleece as i would love to make a pink one. I love this scarf - I need it today in the sub-zero midwest! I linked to it on my Weekend Links post today - thanks for sharing! LOve this scarf! sweater + scarf = <3 Great job! This is beautiful! I love this :) I wish I could make one for myself. I loved this the moment I saw it in the auditions. So glad you were picked for American Crafters. Wow! I love this idea. Can't wait to make one! I am now a follower.